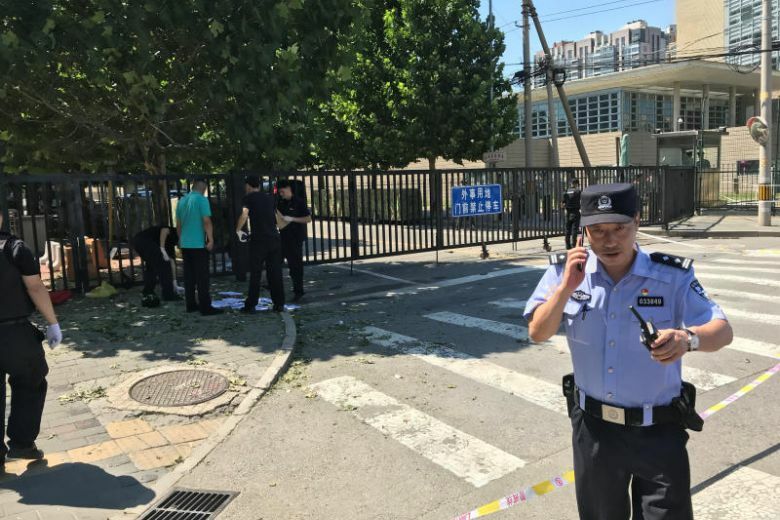 A 26-year-old attacker detonated a bomb at the US embassy in Beijing on Thursday, rattling a diplomatically sensitive zone in the Chinese capital. The blast took place around 1 p.m. and was audible from blocks away. Chinese police said a man from China’s Inner Mongolia region with last name Jiang, who had been trying to call attention to a human rights issue, set off a device made from fireworks that injured his hand. The report claimed there were no other injuries on the scene near the visa applicants line up to enter the US embassy for interviews. Smoke clogged the street causing disarray among visa applicants just after the blast. “We heard a loud explosion around 1:00 pm (local time) so we ran out on the street to have a glimpse, but shortly the police cordoned off the whole area,” said a witness. Earlier in the day, a woman who had also been protesting was detained after soaking herself in gasoline, the agent said. Chinese police said It was not clear whether the two incidents were linked. The street in front of the embassy, Tianze Road, which is also near the embassies of India and Israel, was closed for about an hour after the blast. After the street reopened, a fresh line formed outside the US embassy compound. China has a strong stable system that provides citizens to appeal the government over injustices. But many petitioners revealed that they never received justice and were discouraged and tormented by Chinese security officials. Some such incidents resulted after years of ineffective petitioning where victims turn toward violence as a last resort. Regular incidents are recorded where disgruntled individuals lashing out at society over various grievances or perceived injustices, often harming themselves or others. An identical incident happened in 2013 where a man set off an explosive device at Beijing Capital International Airport, injuring only himself. As China and the US are in the middle of a trade dispute, therefore, such an event can trigger a global destabilization in terms of diplomatic relations, economy, trade and more. It is pivotal for the Chinese government to investigate using advanced investigative techniques that can provide important and accurate intelligence swiftly. Which scientific and reliable technology can swiftly and accurately identify who is actually behind such disruptions and can, provide missing links and information about future attacks? iCognative technology is a neuroscience-based forensic technology perfectly suited for Chinese agencies to investigate and identify the crooked security personnel. This advanced investigative technology offers prompt and accurate identification of criminals by identifying and recording specific brain response called P300/P300 MERMER. This remarkable forensic technology is provided only by Brainwave Science. iCognative technology uses memory related recognition pattern to gain valuable, relevant and accurate information out of a suspect’s brain. This technology’s purpose is to empower law enforcement personnel with different levels of security challenges in their efforts to keep citizens safe and help in the delivery of justice. iCognative can provide the valuable intelligence necessary to solve this complex problem. Approximately 45-minute iCognative test conducted by investigators on suspected security officials and arrested attackers would provide valuable and specific intelligence/lead to the investigating agencies. To conduct a test on a suspect, a test case needs to be built with both known and confidential information about this attack (only known to the perpetrator and investigating agencies), is input into the iCognative system. For example, in explosion case, information such as abused by security officials; type of explosives used; knowledge about bomb-making; link with other attacks; any local group involved; etc. This information, used as stimuli in the form of words, phrases or pictures, depending on its availability, will be flashed to the suspect on a monitor, one after another. iCognative system collects brain responses to each stimulus. At the end of the test, the fully automated software will determine with 99.9% accuracy if the information is present or absent in the brain of the suspect. iCognative by Brainwave Science is an affordable and easy-to-use forensic technology that has a proven track record of supporting law enforcement agencies help protect innocents and help arrest crooked security officials and find links between attacks.